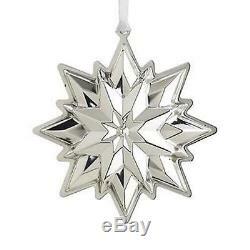 NEW 2013 Lunt Sterling Silver 19th Annual Star Christmas Ornament. This is the 19th in an annual editionning almost two decades. Be sure to get yours before they are all gone! From Lunt, celebrate Christmas with this 2013 "19th Edition" sterling silver Star ornament. This gorgeous sterling silver ornament is elaborately designed, finely executed in keeping with the intricacies of nature and handcrafted in America by skilled silversmiths. These artisans craft each holiday collectible with unmatched attention to detail and an appreciation for the joy of the Christmas season. This ornament comes hanging from a white ribbon, packed in a keepsake gift box & wrapped in a flannel bag to protect it for years to come. As a result, the following series are no longer in production: Sterling Angel, Santa, Williamsburg and Pierced Cross as well as the Silverplate Cross and Snowflake. The Lunt label has been totally eliminated. If by some small chance your item is not satisfactory, your return should still be received within 7 days or less. Be sure to check my other listings for more great Reed & Barton ornaments and crosses and other fine Christmas ornaments, collectibles, Victoriana, elegant glassware and more!!! Your store for more Christmas! It may be in the "To Be Listed" inventory. The item "NEW 2013 Lunt 19th Annual Sterling Silver Star Christmas Ornament Reed Barton" is in sale since Friday, May 17, 2013.